Cheating seems to be such a prevalent problem in our schools today. And it doesn’t matter what type of school it is – public, private, Christian – it’s something that’s happening. And it’s probably happening in your classroom. Don’t think anyone’s cheating in your classroom? Well, as long as your kids are old enough to cheat, it’s probably happening, no matter how great your kids are. I went to a small Christian school and had great classmates, but even some of my classmates that were great kids cheated all the time. It’s just a reality. So what are we as teachers to do? I believe that preventing and dealing with cheating is a battle worth fighting because teaching kids to be honest and to take responsibility for themselves is always worthwhile. My goal was always to make cheating as difficult as possible. Not just to make it tough for those who wanted to cheat but also to help kids who are tempted to cheat make the right choice. 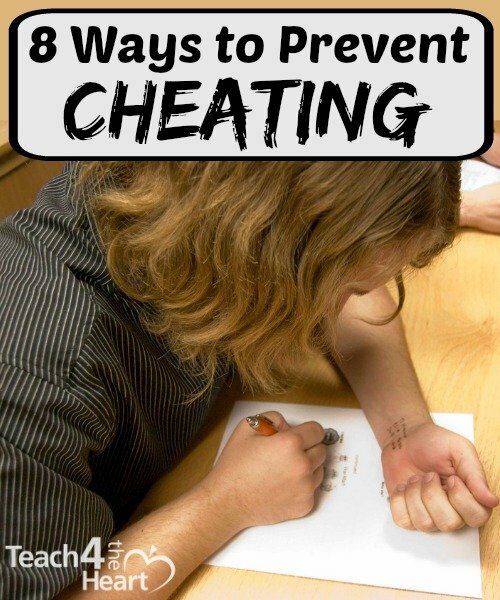 Here are a few practical things you can do to help prevent cheating in your classroom. Require cover sheets. This is super simple. Just require students to use a blank sheet of paper to cover their answers as they take their test. Just make sure that it is a completely blank sheet of paper – nothing at all on it. Require desks to be clear. During testing, require students to completely clear their desks of everything except the test, their cover sheet, and their pen/pencil. If they’re allowed to keep books or other items on their desk, you’re just providing them a place to hide cheat sheets. Don’t allow cell phones. During test times, have very specific procedures for cell phones. Maybe you simply require them to be completely out of sight. Or, have students place them in a designated area for the duration of the test. Walk around the room. I know you probably want to just sit at your desk and get something done, but one of the best ways to prevent cheating is to walk around the room during the test. Or at least to stand at the podium so that you can glance up and/or walk around often to keep an eye on what’s going on. When you walk around, you see things from different angles and are just much more aware of what is going on. Have two versions of the test. For major tests, or for when students are in very close quarters, consider having two versions of the test. You don’t have to recreate any questions; just switch up the order. Then give different versions to every other student. Don’t allow students to get out of their seat or communicate. I normally let my students get up to get tissues or things like that, but during a test, it’s a different story. It’s just too easy for a student to pick up some answers as they walk around the room. So have different requirements for a test than you do during normal instructional times. Don’t let students grade their own work. If you’re taking a paper for a grade, don’t let students grade their own paper. It’s just way too tempting to misgrade your own paper…. Require students to use a different instrument to grade. Just as students can be tempted to misgrade their own papers, they can also be tempted to change the answers on their friends’ papers. So if the quiz is taken in pencil, require students to grade with a pen – and vice versa (or at least a different color). What else do you do to prevent cheating in your classroom? Thank you so much for these tips. I use several of them already. Thank you I needed some answers for homework! The list you provided is great. I made privacy folders by stapling two manila folders together. Not perfect, but it also helps. I noticed that students need something to look at when they process things or think very hard. So I came up with a smiley that I draw on the board whenever we take a test. Now instead of looking sideways aka on their neighbors sheet, they look to the board. Younger students can use privacy folders. any tips on cheating when they are using iPads to complete assessments? One more tip that works well is to ‘allow’ cheating sometimes. For math finals, I would allow students a 3 x 5 note card on which they could write anything they thought might be helpful. I did require it to be stapled to the final when turned in. Students worked so hard on their note cards they inadvertently studied!